Child care for babies is expensive. High-quality infant care, provided by well-trained staff, is even more costly. The median weekly cost for center-based child care for an infant is $222, making it unaffordable for most low- to moderate-income households. Families earning up to double the federal poverty level can qualify for financial assistance to pay for child care while they work or attend school. This is also referred to as a child care subsidy. Unfortunately, subsidy reimbursement rates are low and do not reflect the true cost of delivering high-quality child care. • Stronger education requirements for staff caring for infants and toddlers tied to increased compensation for those that obtain higher education. • Higher subsidy payment rates for providers caring for babies based on the true cost of providing quality child care, allowing families with fewer resources equal access to quality. Expensive, Frustrating and Scary: Parents Reveal the Realities of Finding Child Care for Babies This report summarizes the challenges of finding safe, reliable, and affordable quality child care for infant-toddlers shared by parents in a series of focus groups and interviews. Quality Costs How Much?! Estimating the Cost of Quality Child Care in New Jersey To determine what it would cost to ensure all children are cared for in high‐quality child care settings, Advocates for Children of New Jersey (ACNJ) teamed up with national early childhood financing expert Anne Mitchell to conduct a cost-estimation study using real budgets and cost data from NJ child care providers early care and education stakeholders. Read ACNJ’s recommendations to support quality child care. View an interactive map of NJ’s licensed child care centers that provide infant-toddler care in New Jersey. The map allows a view of centers participating in Grow NJ Kids, NJ’s child care rating and improvement system. On the federal level, ACNJ continues to work with our Congressional delegation to ensure adequate funding of the Child Care and Development Block Grant of 2014, which promised to strengthen child care health and safety standards, mandate new training for child care providers and ensure equal access to quality. While the new standards are a win for kids, adequate funding is needed for states to implement these improvements. So far, Congress has not yet authorized additional funding. In 2016, this affected 59,000 NJ kids in low-income, working families. We need to stand together to urge our elected officials to increase funding for this critical service for our youngest children. What is the State of New Jersey doing to improve child care quality? New Jersey has an initiative, Grow NJ Kids, aimed at giving working parents more information when making one of the most important decisions of their children’s lives — who will care for their kids during their most formative years. It also promises to help child care providers to improve quality through a variety of supports. 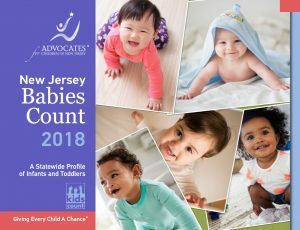 As a lead partner in New Jersey’s Right from the Start campaign and a proud partner of the national ZERO TO THREE Think Babies campaign, ACNJ is working to promote enriching early experiences and a strong foundation for development from the start. Read about our partners. Learn more about the critical importance of the early years of child development, from birth to three.